Wymondham has Neolithic and Roman remains along with evidence of Iron Age occupation. Placenames ending in -ham were villages in Anglo-Saxon times. Nearby Edmondthorpe has Danish origins, Thorpe meaning a small village that has branched off from a larger one. There are several small villages in the area with names of Scandinavian origin, ending in -by; and Leicestershire's River Wreak has a Scandinavian name, meaning "twisted stream". The Norman French, our last invaders, must have liked their new territory, as they included beau or bel in the names for castles and manors, for example nearby Belvoir, pronounced Beaver, which means "beautiful view". The Domesday Book (1086) calls the village Witmeham, Witmehà and Wimundesham, generally interpreted as meaning "Wygmund's ham" i.e. Wygmund's homestead. In Saxon times Wymondham lay within the boundaries of the Kingdom of Mercia, one of whose kings was Witlaf (827-840). He had a son Wymand (Wygmund), after whom this village took its name, probably because he had it for part of his maintenance and upkeep. St Peter's church predates 1150, but there would have been a church here in Saxon times, which was probably demolished by the Danes. The Sir John Sedley Educational Foundation, endowed in 1637 with £400 for the purchase of farmland, has over the centuries funded the building and operation of two schools. The first was located in a small building, which still stands next to the church, while the 19th century Grammar School is on the Melton Mowbray edge of the village. The Foundation has more recently funded the community centre and current projects include the establishment of an information technology centre and the provision of tennis courts. The Church of England Primary School was relocated from Church Lane to its present building at the west end of the village in the late 1960s. Wymondham is on the route from Melton Mowbray to the A1 - "the Great North Road" - which links London and Edinburgh, and the village was a stopping-off point for cattle-drovers and other travellers in earlier centuries. Mrs. Frances Pawlett, a resident of the village in the 18th Century, did much to establish Stilton as "the King of English cheeses". She supplied her brother-in-law who was landlord of the Bell Inn at Stilton on the Great North Road. In 1727 the writer Daniel Defoe is quoted as saying he passed through Stilton, a town famous for cheese. Mrs. Pawlett died a wealthy woman on Christmas Eve, 1808 at the age of 88. The inscription on her headstone reads: "Remember to Die" as she had outlived her son and most of her other close relatives who could have expected an inheritance. Frances Pawlett's house later became the Hunter's Arms Hotel, but is now a private house once more - a Grade-II listed building. Stilton cheese production continued in Wymondham until defeated by the problems of wartime restrictions in the early 1940s. Several of the current Stilton-producing dairies have websites, ranging in sophistication from Webster's of Saxelbye (still producing Stilton in their original 19th century building) to that of Long Clawson Dairy, who add fruitcake and other ingredients to make an award-winning range of flavoured White Stilton. But it often takes an outside view to tell us what is precious of our own, and you can get that about Stilton from the epicureans of the Stilton US Information Bureau. Food products that make use of natural fermentation processes benefit from a "stable home environment", where the spores can readily find their foodsource and convert it into one of ours. When Tim Tarratt was running his stables at Wymondham Manor he had the cellars checked for microbiological evidence of Stilton cheese production, and was featured on a local TV programme. Stilton producers faced a fight to retain the use of unpasteurized milk following the listeria bacteria scare of the late 1980s. While expectant mothers should make their own informed decisions over what to eat, they can be sure that the quality of Stilton cheese has never been higher, whether produced from unpasteurized milk or not. Cheese exports at Long Clawson Dairy have been hit by the foot-and-mouth crisis. The Stilton maker exports around £50,000 worth of produce a week to Europe and America but last week's widespread export ban on a variety of British produce forced the dairy to stop production of export orders. Chief executive Neil Bailey said: "We have stopped work on export orders but it hasn't got to the stage where it has become an employment related issue." He added he was expecting exports to resume any minute after securing the necessary forms and certificates proving the produce was completely safe. Mr Bailey added the authorities in Europe and America were rightly concerned and taking sensible precautions. The crisis has also forced the dairy to take extra precautions at the manufacturing sites in Long Clawson and Bottesford and when collecting milk from dairies in the area. The dairy makes 34 pick-ups a day and tankers were being disinfected before visiting every new farm and all farmers were being extra careful. Mr Bailey said: "It's going to get worse before it gets better, that's my personal view. I don't think we've seen the full scale of the outbreak but I hope it will come under control in the next seven days." A spokesman for Tuxford and Tebbutt in Melton said the crisis had not had any effect on business but the firm was taking precautions like everyone else. Long Clawson Dairy is exporting Stilton to Europe again after some exports had been delayed by up to three weeks because of the foot-and-mouth crisis. Dairy chief executive Neil Bailey said: "Most of the problems have eased on the export side in terms of releasing products from the UK." But he said consumers in America appeared to be concerned about the foot-and-mouth crisis in Britain. He added: "Although it isn't a food safety issue they're aware that we have a problem with foot-and-mouth and that could be a problem for future sales." Mr Bailey said the dairy was keeping up its precautions when collecting milk and making deliveries, such as disinfecting vehicles. By the autumn of 2001, Leicestershire was deemed clear of foot-and-mouth and the last affected areas, in the north of England, were given the all-clear by the end of the year. 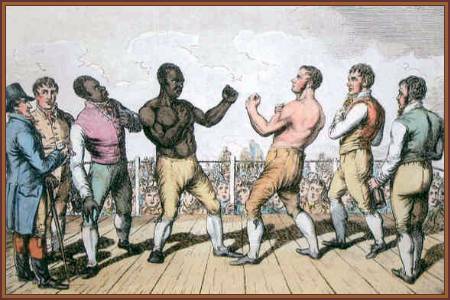 On September 28th, 1811, Thistleton Gap, a field outside the village which is the juncture between the three counties of Leicestershire, Lincolnshire and Rutland, was the location of the very first International Prize Fight. England's Tom Cribb defended his title against Tom Molyneux of America, winning £2,600 and a cup, valued at 80 guineas. The crowd of 20,000 gambling on the outcome thought they would be able to cross the borders from one county to another, and so evade the attentions of the magistrates from each. It is said that some members of the Rutland bench came to watch. The fight lasted 19 minutes and 10 seconds, and ended with Molyneux unconscious and the victorious Cribb dancing a hornpipe in the ring. Come, you gentlemen of fancy. The winner to take all. The victor shall be called. All roads in England lead. And that is sport, indeed. Than ever yet were born. Hangs bright against the sky. To Rutlandshire, to Rutlandshire etc. The white against the brown. The second round has won. 'Tis to Molyneux they go. One eye sees no more. Defeat for him is sure. He stumbles to the mark. Now, Tom Molyneux leaps forward. He's brought unto his knees. His dream of glory gone. Tom Cribb the crown has won. And that was sport, indeed! The verses above are included on the 1976 folk recording "New Bell Wake" by Roy Bailey. Copies of the CD re-issue are still available for £12 inc. P&P from www.roybailey.net (link opens in a new window). Wymondhamians are fond of their windmill, built in 1814. It is now emblazoned on the sweatshirts worn by pupils of the Primary School. Miller's Cottage is on Main Street, a human-scale commuting distance for the original incumbent, uphill in the morning and downhill home in the evening. The windmill was unusual in having six sails. Not many years after it was built a steam mill with a tall chimney was built in the village. The machinery at the windmill was in turn converted to engine-power at the beginning of the 20th century. The site is now a principal visitor attraction for the area. Wymondham has a population of about 500. Newcomers often move into Park Cottages, at the east end of the village. Once here, people tend to stay, and move on to larger houses in the village. New building regularly takes place as plots are developed for single dwellings and houses are extended. The older houses are built of honey-coloured ironstone or local brick, with roofs of slate or pantiles. Wymondham once had its own brickworks, at the end of Brickyard Lane. There are still a few thatched roofs to be seen in the area. Some villagers are still employed in agriculture, and Space Foods, which is on the site of an old Stilton cheese factory and the first Manor House, employed people until December, 2000 from the village and outside in the manufacture of herb-flavoured food items such as mint sauce and stuffing mixes. Self-employed craftsmen and women work at the windmill, but Wymondham is now principally a commuter village, with people travelling to work in Melton Mowbray, Oakham, Leicester, Nottingham, Peterborough and as far away as London. Scanned pages from the late Ralph Penniston Taylor's "A History of Wymondham, Leicestershire" are available here. These are mainly pages of family history and are a stop-gap measure because conversion to webpages will take so long. The scans are titled with the page number from the book and the name of their principal subject. Copies of the book are available for reference at Melton Mowbray and Oakham libraries.